can immediately feel the effect of the crystal pyramid depends on how advanced one is in meditation. For beginners, they feel nothing at first. For advanced practitioners, the effect is very obvious. For the average practitioners like my wife, and myself we feel the effect while meditating under the crystal pyramid. But I can categorically state: If one practices meditation under a crystal pyramid, one can advance quicker in meditation than doing so without one: from beginner to intermediate, to advanced level. If one practices meditation under a pyramid, especially one with crystal, one can feel the effect of his practice sooner. In my own case, I can feel the effect in 3-5 minutes instead of 15-30 minutes. 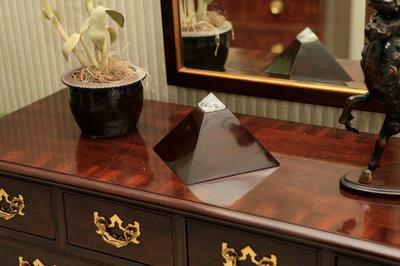 Crystal pyramid helps our sleep. Our crystal pyramid is about the size of a camping tent. My wife and I playfully slept with our sleeping bags under the pyramid (indoors), and we slept better than ever. We tried it several nights. The results were the same. My daughter who often has sleeping problems and often uses sleeping pills asked me to build her a crystal pyramid to cover her bed. She slept well under it since without the use of sleeping pills. One day, she experimentally removed the pyramid, and her sleeping problem returned. She quickly re-installed the pyramid the next day and she slept well again. This is our experience. Your result may vary.